The Telecaster has become pretty much synonymous with country music. Much of the classic mojo of the Telecaster comes from its single-coil bridge pickup, which is mounted on a steel bridge plate (with the strings typically routed through the back of the body). This distinctive pickup setup gives the Telecaster its famous “twang,” clarity, and harmonic richness, which has made it a favorite of countless guitarists, from Jimmy Bryant in the 1950’s to contemporary stars such as Brad Paisley. 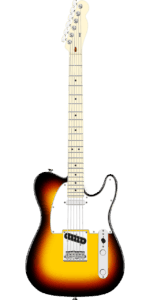 Over the years, some particular playing styles and techniques have accumulated around the Telecaster and come to define the essence of country guitar. If you’re a country player these techniques might make up the bread and butter of your style, but even if you’re not big into country, these techniques can be incorporated into a lot more genres than you might think—guitarists as disparate as Ryan Adams, Zakk Wylde, and Nels Cline have all found ways to integrate what are traditionally considered “country” techniques into completely different playing styles. For one, playing bass notes on the lower strings makes it easy to move fretting hand up and down the neck. For another, multi-step open string pull-offs can be played at lightning speed with some practice, and speed is always appreciated in chicken pickin’. It is not surprising then that country players prefer guitar friendly keys such as A major, E major, D major, and G major. A typical country lick played in the key of A major serves as a nifty example. Play B (3rd string/4th fret) with the guitar pick. Pull off to A on the 2nd fret and then pull off to the open G. Play the same riff on the D string and then play C-C#-A on the A string. The lick is usually played with straight eighth notes but you can try different rhythms. Similar pull-offs and licks can be played on the D and E strings. Another classic country guitar lick trick (pardon the rhyme) is to combine hybrid picking with a descending run. Hybrid picking combines a guitar pick with fingerpicking. The pick produces clear, articulate sound and plucking the strings with the fingers can be used to give the strings a popping sound that makes the notes stick out. A typical descending run in the key of C major is played on the 5th to 8th frets on the 1st, 2nd, and 3rd strings. The notes are based on the C major pentatonic scale (C, D, E, G, A). The descending run is played in four-note groups of eighth notes combining hybrid picked notes and pull-offs. Play C (1st string/8th fret) with your middle finger. Pull off to A (1st string/5th fret). Play G (2nd string/8th fret) with the guitar pick and pull off to E (2nd string/5th fret). Play A on the 1st string with your middle finger. Play G on the 2nd string. Pull off to E (2nd string/5th fret) and end with D (3rd string/7th fret). The second part of the run is played on the 2nd and 3rd strings using the same pattern and ending on C (3rd string/5th fret). You can play descending and ascending runs using the same technique. Once you’ve got the run down, the essential thing to focus on is the hybrid picking technique. The pick/finger combination provides interesting tones and dynamic possibilities and can create a lot of variation and expression, even when repeating the same phrasing. Focus on pulling the string as pluck it with your middle finger, the way that a bass player would “pop” their 1st string in a hunk riff. Done right, this technique helps to give you the “twangy” sound heard in so many classic country guitar licks — especially when done on a tele. Double stops— two notes played simultaneously—are an essential part of the country guitar licks playbook. Double stops in country guitar are usually played with a pick/finger combination or sometimes with the ring and middle fingers. One classic bluesy example is based on the minor pentatonic scale. The E position pentatonic scale serves as home base. The notes are E, G, A, B, D. Start the double stop lick on the upbeat of beat one by plucking the G and B strings at the 14th fret with your middle and ring fingers. Next play the same strings at the 12th fret. You can either pluck the strings with your fingers or do a pull-off from the 14th fret. Finish the phrase by playing E (14th fret/4th string) with your guitar pick. Though simple, this lick can be played in numerous combinations using the 2nd and 3rd strings or 1st and 2nd strings. For extra credit, try Telecaster virtuoso Danny Gatton’s interesting variation of this lick. He would use the E on the 4th string to play pedal notes as he played double stops on the 3rd, 2nd, and 1st strings. James Burton is one of the undisputed masters of the Telecaster. Burton came on the scene in the 1950s playing with Ricky Nelson and went on to play with Elvis, Emmy Lou Harris, and scores of other legendary musicians. Burton helped to popularize a technique that would come to be heard in countless country guitar licks. It’s called chicken pickin’—a staccato picking technique that is thought to have gotten its name because it simulates kind of a clucking-like sound. The essential thing with chicken pickin’—alongside playing with the right compressor pedal—is to mute the string immediately after picking a note. Play D (2nd fret/3rd string) with the pick using a downstroke. Immediately lift your fretting finger to mute the note. Strike the muted string with the pick with a downstroke and upstroke. A similar effect can be achieved by laying the fingernail of the middle finger of the picking hand on the string. This will also mute or clip the note and produce a chicken-like sound, Another chicken pickin’ technique is to roll the guitar pick across the muted strings below the string you are playing. This is just one aspect of the chicken pickin’ style though, there’s a whole range of scales, tricks, tips, and techniques heard in countless country guitar licks, and we’ll try to dive deeper into in a future article. But regardless of the guitar or genre you favor, practicing up on some country guitar licks is a great way to broaden your horizons, and maybe even find something unique you can take back to your own style of playing.